Ali over at Very Berry Handmade has written a lovely write up about the Akonye Kena fabrics I am carrying in the shop. I wrote to her a couple of weeks back when I discovered she was writing a Guide to Buying Fair Trade and Eco-Friendly Fabric. 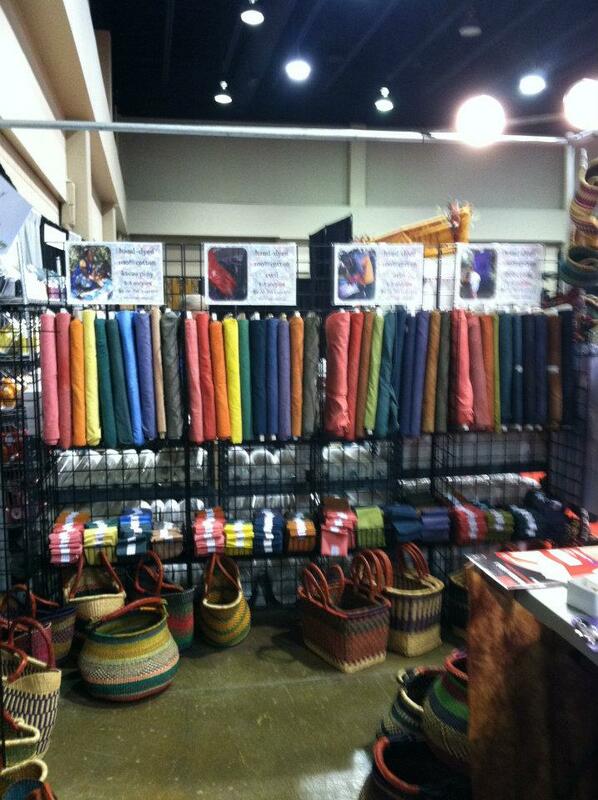 The Akonye Kena fabrics are a range of hand dyed cotton cloth produced in East Africa by a self-sufficiency group. Founded in 2009, Akonye Kena, meaning 'I will help myself' in Acholi (a tribal language of North Uganda) make paper beads, hand-woven baskets, necklaces and other lovely things as well as hand-dyed fabric. Akonye Kena by me in Blacks and Blues! Over the last couple of years they have worked hard to promote and market their products in accordance with Fair Trade Principles and they currently trade their products at Bead and Quilt shows across America. They work hard too at these shows -- last year they did around 40 shows ! I only did a couple last year and that near killed me, so my hat goes off to them just for that. 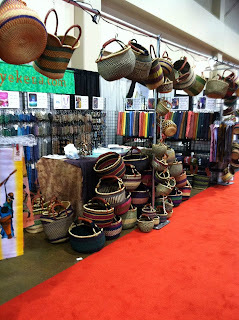 I came across Akonye Kena while I was at Houston Quilt Market last October. Now I have to honest and say it was my travel companion that spotted the lively looking booth first and dragged me along for a look ... but one look and I was hooked. 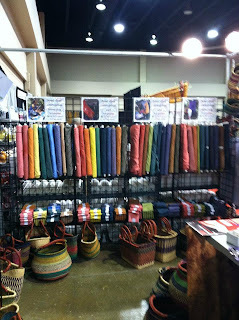 The booth was a riot of colour ... beads and baskets hung from the rafters (if a booth can have rafters ...but you know ..the struts that go across them ) and the fabric just shone. On top of this the booth holder, Richard the Kilt , as I call him (in honour of the kilt and doc martins he sported) was a delight! He just made me roar with laughter with his somewhat saucy jokes too. After some discussion and chat I walked away having purchased the full line of fabrics, all 60 of them. 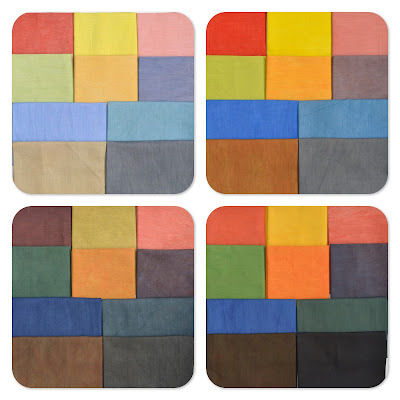 The fabrics are split into 2 groups, either natural dyed or chemical dyes. The 20 natural dyed fabrics are called Bark and Berries. The dyes are collected from natural materials local to the area and include wonderfully exotic plants with names like ... The Sausage Tree! 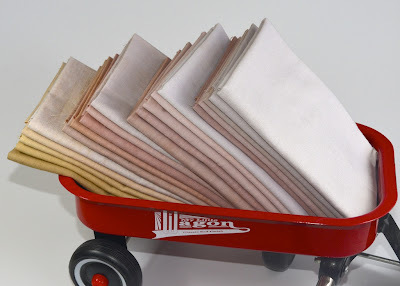 The natural dyes are very subtle and soft to look at and really have the look of linen to me. They feel wonderfully soft too despite the somewhat coarser open weave. The chemical dyes are called Seed to Sewer because the cotton is grown in Uganda, produced in Uganda and dyed in Uganda! There are 40 cottons in this range and they are subdivided into Seasons - Summer, Winter, Spring and Autumn. Now those names are for our benefit because they don't have Seasons as such in Uganda at all. They have a rainy and a dry season and that's it! The colours of the Seasons are spectacular though. 4 shades of 10 colours make up the 40 fabrics. Each group gives good tonal variation too. Do hop over to the website and take a look at them. Better still consider buying a fat quarter - which by the way is larger than your average fat quarter at 29" x 20" - so really a Tubby Qtr. When you purchase ... yes you are buying it from me and I will make a small profit but the more I sell the more I can buy from Akonye Kena and in turn we can all help young men and women help themselves. We are currently in the middle of Fair trade fortnight and to celebrate this I am giving away a huge bundle of the Akonye Kena fabrics to one lucky winner. Visit VeryBerryHandmade to join the giveaway. What a wonderful giveaway Tracey. They look like great fabrics and made even better by the background story they have to go with them. I am not usually drawn to solids, but the colours of these are amazing. I am really looking at my bedroom and seeing it transformed.